If you want to connected every time with your friends with you Facebook via Blackberry so Chit Chat for Facebook Application for you Its Provide many great powerful features to your Chat. 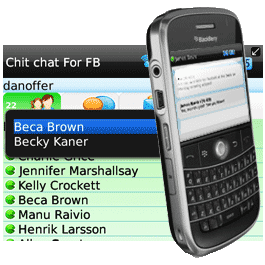 ChitChat is a Blackberry Application for Facebook that provides background, message bubbles, font size and font colour to make it easy for you to talk to may friends. your Blackberry will play a sound and vibrate when a Facebook message has been received. This can be turned off if you prefer.